Australia is losing its “fair go” culture and is under threat from a elite and rich group of wealthy business people – including Andrew forest, Gina Rinehart and Clive Palmer – who are using their riches to undermine good Policy and threaten our democracy –says Treasurer Wayne Swan . Mr swan has steered most businesses in Australia through the GFC with much less impact than has been felt throughout other economies. 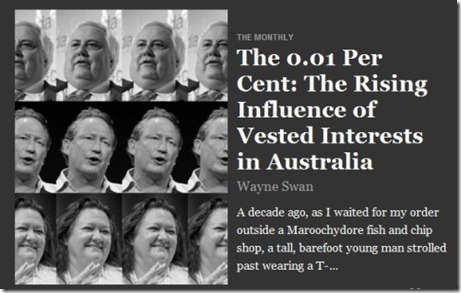 Mr Swan said Australians should be concerned about the excessive and increasing power of vested interests with power and wealth to back up their agenda to their own benefit. This was evident when major Mining companies said they were cutting down expansions and staff due to the Mining tax and GFC and other factors, but soon as the Rudd led cabinet was shafted in favour of Julia Gillard they went ahead with their million dollar project expansions. There was bitterness after the mineral resource rent tax and carbon price was introduced with the purses of the wealthy being hit. The big miners Invested millions of dollars in opposing these taxes and policies by advertising in TV and print media , saying it would hit the common man in Australia. It is unusual that this direct method was used by the wealthy corporations rather than politicians being influenced and lobbying being done which is often the case at times. Mr swan has urged Politicians to cater to and look after the common mans benefit , and supporting the workers rather than succumbing to the lobbying of the wealthy and to give Australia the sense of fairness and decency it deserves. The government is said to be in the midst of considering a report on media law reform. This could be the result of Gina Rinehart taking a large shareholding in The seven news media network , making her even more powerful which could be a cause for concern for many only not only within the media industry but also outside the media industry. Radio , TV and Newspapers due to the power they wield have often have been claimed to support and make and break governments in other countries , deciding on who they decide to favour. Mr swan goes on to write that the mining campaigns brought out by the wealthy people against the tax damaged the government , brought on instability and resulted in prime minister Mr Rudd being toppled. With this proposed Mining tax not going through, the government will be short of $110 Billion to use towards taxpayers benefit. 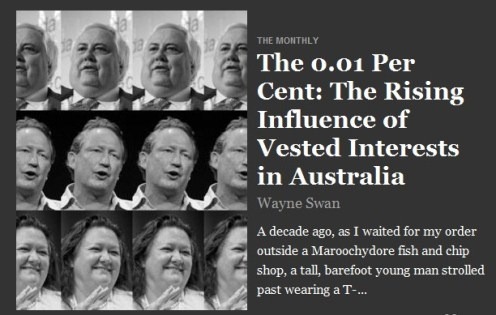 Mr swan said "It is the tiny 1 precent, or even 0.1 per cent (you know who they are) who are trying to drown out the others, who are blind to the national interest and pour their considerable personal fortune into advertising ,armies of lobbyist, dodgy modelling,and corporate and commercial manoeuvring designed to influence editorial decisions.